A few years ago, Seattle ran an interesting experiment on radically densifying low rise neighborhoods with microhousing–a typology of small, minimal units that provide somewhat affordable rents as an alternative to expensive apartments or shared housing. They came in two varieties – Small Efficiency Dwelling Units (SEDUs), micro-sized studios; and Congregate Housing, housing with smaller areas for bathing and sleeping with shared kitchens and amenity spaces. They were sort of a market-rate play on the existenzminimum –and they induced a lot of consternation– from homeowners who resented an influx of people who couldn’t afford million dollar homes, to those who believe small apartments are inhumane. In response, the city passed legislation that severely curtailed the production of congregate housing. This was intriguing to me, because Congregate Housing was a bit of a cousin to the Clusterwohnung. The Clusterwohnung, German for cluster apartment, is a hybrid between a small apartment and a shared residence. It’s a housing typology that isn’t common, but has seen a bit of an uptick in recent years on some high quality affordable housing projects in Germany and Switzerland. They’re supersized dwelling units with communal kitchen, living room, dining spaces – that are paired with smaller private units or rooms with their own bathrooms, and in some instances kitchenettes. The idea is that the common spaces of the house, which are generally some of the least utilized, are shared between more people. In addition, the cost of food, utilities, and household chores can be divvied up to reduce the financial burdens and time. If this has you thinking of a housing or student coop –that’s because the clusterwohnung is rooted in cooperative and communal living. Many of these projects support alternative family models and lifestyles. And they’re components of larger multifamily buildings—this isn’t a variation of living in a single family house. Some of the cluster apartments are in buildings almost exclusively of other cluster apartments, some are a single cluster unit in a more typical multifamily building. There are also several flavors of cluster apartments, which can cater to a larger number of households. Some are also incredibly large, and have several dispersed common areas. Meals are often shared, but not required to be. The scale of some of these are amazing –and they vary considerably, from a few households to a unit of 50. In some instances, clusterwohnungen are also used for disabled residents, and senior housing. They stand in stark contrast to the model of multifamily housing typical for shared residences –offering more private space, as well as a more communal sphere. You can start to see the games that can be played –How many families can you fit in one unit? What is the smallest, most affordable private space we could get away with, to ensure that the larger communal space is of a high quality and livable for all residents? 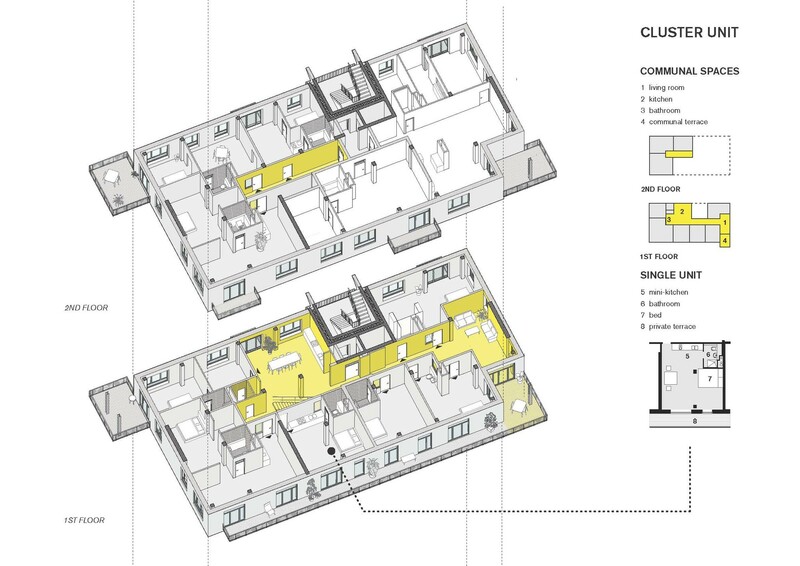 How do we design units that accommodate both elderly and young residents, and affordably? These concepts aren’t exactly new, though how they get marketed, designed, financed, and/or packaged may be. There are maaaaany models of collective housing that predate clusterwohnungen, but have been lost or forgotten over time. And ever present in the background of my mind, Moisei Ginzburg’s constructivist Dom Narkomfin, though the reality is that it’s deteriorating. The multifamily cooperative Kraftwerk2 by Adrian Streich Architekten is located on the outskirts of Zuerich, It includes a wide diversity of unit types ranging from studios to clusterwohnungen – of which there are several. The larger one is a six-unit CW 3,500 square feet unit where most units have a private bathroom and minikitchen. Some of the private units have multiple rooms. The common space, over a third of the unit’s area, includes a terrace, common dining and kitchen area, and several sitting areas. There’s a guest bathroom as well. (Pics here, plan here). Another cooperative built by Kraftwerk1 featuring clusterwohnungen, is the Zwicky Sued, a brownfield redevelopment by Schneider Studer Primas in the suburbs of Zuerich. One version of an 11-unit CW– note that it has both a large kitchen, and a small teekuche (mini kitchen), and most of the restrooms are shared between units/guests. Another 11-bedroom floor plan can be seen here, with units sporting both shared and private restrooms, as well as several seating and dining areas – as well common roof deck. 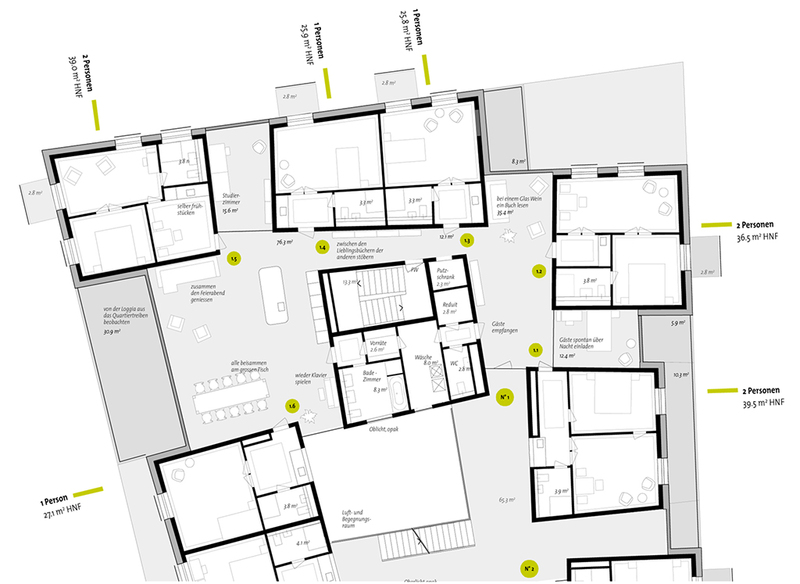 Duplex Architekten’s Haus A at Mehr als Wohnen, a cooperative in the Hunziker Areal redevelopment in Zuerich, features a number of 5-unit CWs, with each unit having its own bathroom and mini-kitchen (partial plan here). Common space includes two generous outdoor terraces, kitchen and dining. There are several seating areas of various dimension, as well as a guest bathroom, storage and laundry room. (Plans and pics here.) The Hunziker Areal redevelopment is really something else, I’m not sure why this hasn’t picked up as a model for turning brownfields into neighborhoods – but it should be. Interesting idea I had not run across before. Such a residence would be quite interesting for a multi-generational household.